All over the district, high school students are posting about helping others, whether it's being a sounding board for a friend, putting away the trash cans for a neighbor or buying flowers for a teacher. Edison High School senior Ollie Wagner said the kindness campaign, which began with Edison at the start of the school year, has made a noticeable difference on her campus. "There's been a complete shift on campus, less fights, a lot less issues," Ollie said. "We've seen a huge shift in the way our students interact with each other and teachers as well." Edison's #bekindbeatiger launched 500 social media posts about random acts of kindness in just the first week of school. 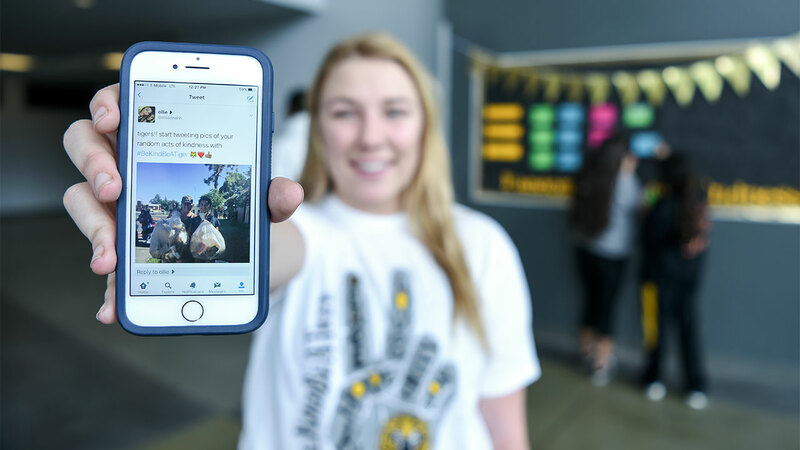 The Student Advisory Board (SAB), made up of student leaders from all district high schools, has set out to replicate Edison's effort districtwide, and is encouraging staff and Fresno Unified school board members to post acts of kindness on social media as well. The goal of #bekindbealeader is to post 15,000 kindness acts by May 16, SAB's last meeting of the school year. Kindness acts can be captured on all social media forums, including Twitter, Instagram and Facebook. Results will be announced at the May 17 board of education meeting. "We could use everyone's help," said Leslie Loewen, district campus culture manager. "If you see an act of kindness you should post it. If you do an act of kindness, you should let us know, even if it feels unnatural. Your act of kindness inspires others." This latest kindness effort builds on the Human Element kindness campaign Fresno Unified high school student leaders have been spreading at all campuses since the 2012-13 school year. Ollie said the #bekindbealeader is especially important now. "There's so much hatred in the media, so much outrage, hate speeches," Ollie said. "I think it's so important to instill in children, in teenagers...that no matter how much hatred there is in the world, kindness starts with just one person."